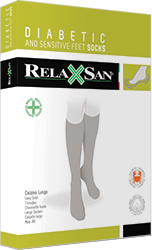 Unisex Cotton socks with Crabyon fiber for diabetic and sensitive feet. Compression less and seamless construction. Crabyon fiber, thanks to the natural properties of Chitin, provides protection and a regenerating action which maintains the foot stays in a protected and healthy environment. Reinforced and anatomical toe and heel provide for a perfect fit and long durability. Available in three different lengths. Chitine, which constitutes Crabyon molecule with cellulose, is known and used long ago for the treatment of dermatitis and wounds and as adjuvant substance of the regeneration of tissues and as anti-haemorrhage.